The Beam Brush can talk to your smartphone. Reports have appeared over the weekend of a US company marketing a Bluetooth-enabled toothbrush that can record brushing times and data on a smartphone app and make them available to a dentist or hygienist at regular appointments. The Beam Brush markets itself as the world’s first smart toothbrush, a manual brush that monitors your oral hygiene habits and reports them to a smartphone app. People simply download the beam app to their smartphone, apply toothpaste to the brush, then sync with their smartphone automatically while using the app, or manually at their convenience. Despite a natural niggling suspicion that a Bluetooth-enabled toothbrush is right up there with the Internet-enabled fridge for redundant technology, the company does point out that there are marketing advantages to offering the brush to patients. 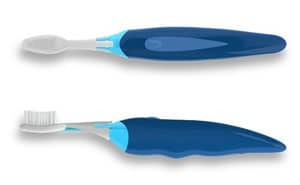 Available in Blue and Pink the toothbrush has a battery life of 90 days and could cost about $50. The company says the app will alert you when it’s time to replace your brush head, and you can purchase your next head right on your phone. They also say Beam replacement heads cost about the same as a regular manual toothbrush. Next articleNo outcomes for aged care project? We need this to be enabled for dental floss too!